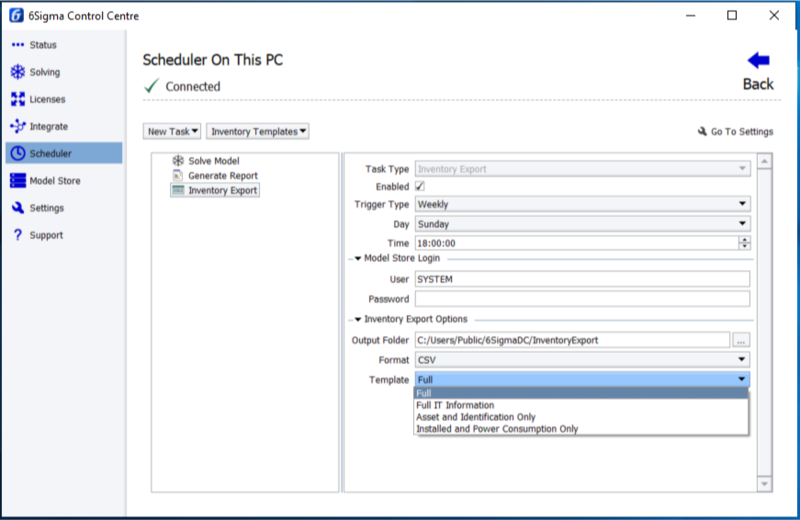 The 6Sigma Control Center Scheduler feature, new for Release 13, can help data center operations, engineering and IT teams. The 6Sigma Control Center Scheduler allows DC operators to gather data and generate reports on current and future data center performance, making it possible to foresee and manage potential issues that may arise from upcoming IT deployments. The Scheduler is found in the 6Sigma Control Center. Here you can create, schedule and manage tasks. For example, run a simulation of your data center and generate a report showing cooling and power utilization each month. Once the Model Store and 6SigmaAccess are set up, you can select a model from the Model Store and schedule a Solve. Then you can choose Solve options, such as the date and time to perform the Solve, and how compute resource should be allocated. The same process can be used to generate the results of the simulation, as well as other important operational information, e.g. metrics concerning the power network. 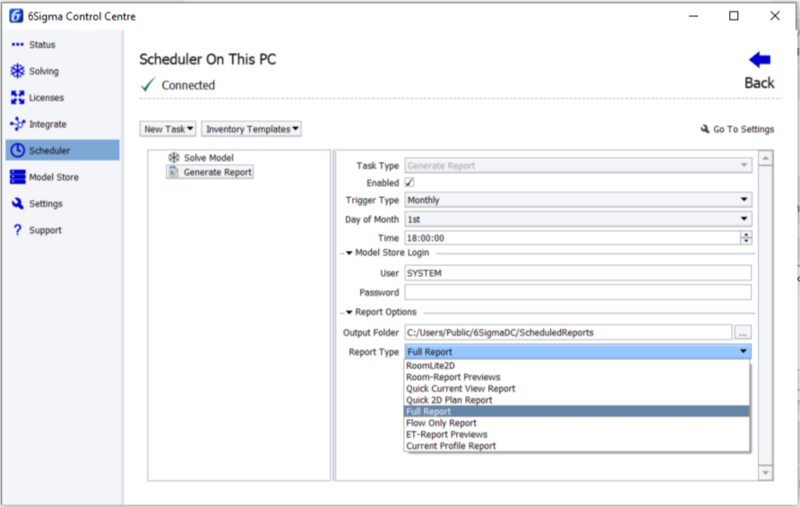 The Scheduler also allows you to automatically export IT inventories quickly and flexible. For example, an IT team may require basic asset ownership and identification information once per week, whereas a different team may require installation and power consumption information once per month. In the Scheduler, templates that require such information can be created and generated according to a customizable schedule, making collecting and distributing this vital information efficient and secure. 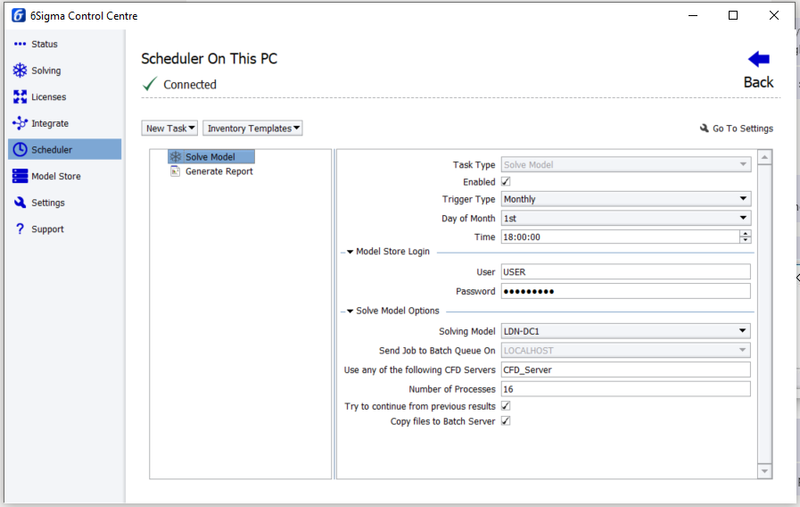 Using the Scheduler, you can automatically delete old results and models from your Model Store, ensuring efficient use of your storage resources. The Scheduler tool can provide benefits to a wide number of teams within any DC business by generating useful information concerning DC performance, proactively identifying bottlenecks and automating tasks to improve operational efficiency. If you would like more information on how to set up and use the 6Sigma Control Center Scheduler, go to File > Help from the Control Center window or contact support@futurefacilities.com.